Jerome is the perfect, little ghost town to visit on any road trip through Arizona or even as a day trip from Phoenix, Prescott or Tucson. Whether you're staying overnight or just driving past, this guide will help you take in all the sights, sounds and savoury delights that this unique, old mining village has to offer! Before we get into the places to visit, just a bit of history to set the scene... Jerome was founded in the late 19th century on Cleopatra Hill. It overlooks the scenic Verde Valley, which is 5,000 feet above sea level. During its heyday, it was home to more than 15,000 people. In WWI, the price of copper soared and American citizens came here in droves to mine the rich copper quarries that were abundant in this area of the west. Jerome was known as the wildest town in the west. It had a reputation for gambling, alcohol abundance, drug abuse, gunfights and other mayhem. But when the copper deposits were exhausted and the town became subject to numerous fires, earthquakes and other natural disasters, the population continued to decrease and eventually it became a ghost town with little to no sustainable source of income. As of 2010 the population was only 444 people. In the late 60's, the Arizonian Tourism board saw it's untouched architectural and cultural potential and established Jerome as a Historical Landmark in 1967. In the late 2000's, art galleries and trendy restaurants started popping up to drive more people into the town. 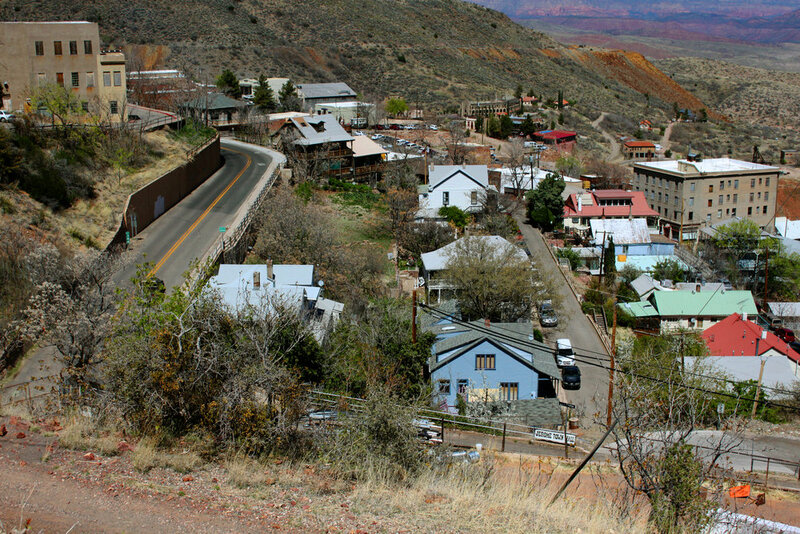 The local State Park and National Museum was established to help preserve the history of mining in this village and to educate travelling visitors on the history of mining in Jerome. To begin your journey in Jerome, the best place to start is at the Jerome State Historic Park located inside the old Douglas Mansion. The Museum is located on the other side of the town and provides fantastic views of the city and the phenomenal Verde Valley. Inside the museum you'll get a great primer for what you're going to see once you step inside the city. 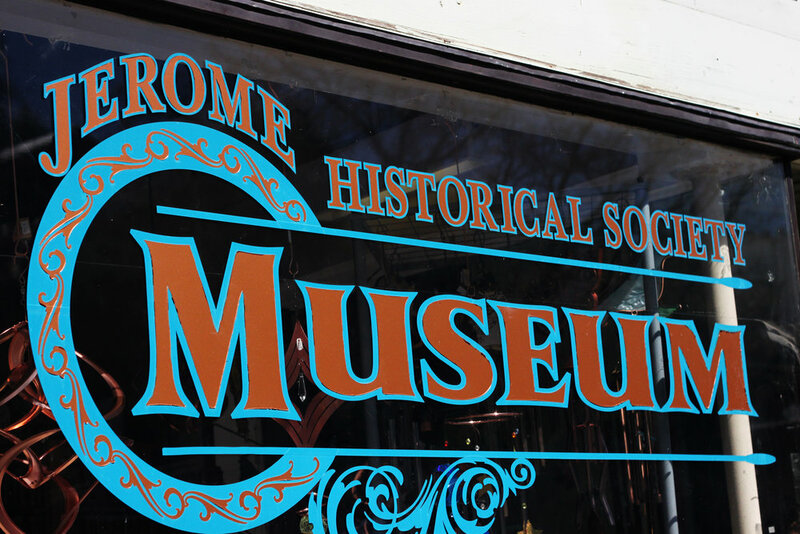 It's a fantastic historical resource devoted to the preservation of the city of Jerome. The Douglas Mansion was built in 1916 by James S. Douglas. He built it up on the hill beside the Little Daisy Mine which he owned. You can still see the old mine from the Mansion viewpoint. After his death, the house was turned into a National Museum and features photographs, mining artifacts, and minerals. They also have a video presentation and a 3-D model of the town as it was in the 1900s along with a model of the underground mines. Outside the mansion, you can visit the Audrey Headframe Park. It's open from 8am-5pm where guests can stand on a glass floor above a 1,900 foot shaft where miners used to descend daily to begin their duties in 1918. One of the best views of the city and Cleopatra Hill is from inside the Museum. The lookout point in the courtyard provides panoramic views of the Verde Valley as well as the entire city of Jerome. You are provided with a map and an infograph of all the buildings (past and present). Once you've had your fill of history, it's time to get back in your car and drive into the city. Main Street is the perfect place to find parking and drop your car off before you begin your walk. If you plan on staying overnight, then your hotel might provide overnight parking as well but there are lots of great spots right across from the Bartlett Hotel. Once you've parked your car, jet back across the street and look over the plaque dedicated to the Barlett Hotel. This is a perfect place to start your walking tour. The original building built on this spot was once called the Grandview Hotel and was constructed in 1895. It was a dancehall, a dining room and and a high-society social club. In 1898 a great fire broke out throughout the city and the hotel was destroyed. The Bartlett Hotel was rebuilt in 1901, this time using bricks, hoping this would help withstand another fire. It was a lavish hotel. Each room was decorated in a different colour, making every guest feel uniquely special. The New Jerome's Times, the longest running newspaper, ran its offices out of the Bartlett hotel for 20 years until it had to shut its doors due to poor circulation. The building was also used as a bank, drug store, and has four different offices and shops along the ground floor. But in the late 1940's, the building became unstable and eventually abandoned. Now, all that's left of it is the framing. The Jerome Historical society has set up set up wooden ghosts apparitions for tourists to throw penny’s into to help raise money for future repairs and hopefully more preservation efforts throughout the city. 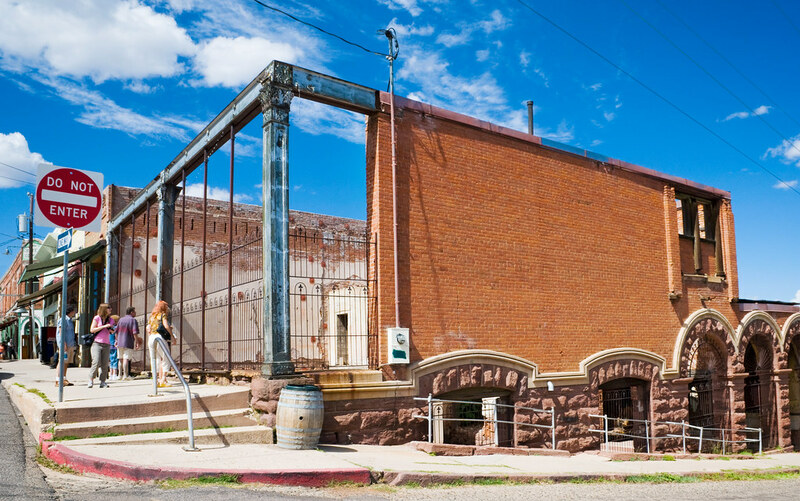 After visiting the Bartlett Hotel, wander down the street until you get to the Jerome Historical Society Mine Museum. When you think "Museum" you might think "Oh no, we just were at one of these today!" But fear not! This place only costs $2 and takes only a few minutes to walk through. It gives you a better glimpse into what the lives were like for the miners who lived in Jerome during these boom times. It tells you stories from the perspectives of the miners themselves. You'll learn why Jerome was named the Wickedest Town in The West and hear about how the miners sought their fortunes in the "billion dollar mining camp". They also have over 11,000 maps, newspapers and documents. The Historical Society also is responsible for protecting and preserving this town so you know your entry fee is going toward the preservation of this old city for future visitors. Walking north east along Main Street and you'll come upon the Hotel Connor and the Spirit Room. Be sure to stop in here for a drink along your journey as the desert heat can leave any traveller mighty thirty. This famous ghost sighting stop is a must see building along your tour. Built in 1898 by David Connor, the Connor Hotel was one of Jerome precious jewels of the past. Originally this hotel was built with over twenty rooms on the second floor to house all the different travelling miners, business men and contractors coming from all over the west to cash in on the natural resources to be found here Verde Valley. Rooms only cost $1.00 but back in that day that was a kings random and the Connor Hotel didn't disappoint. There was a bar, card room and even billiard tables on the first floor. Just like the Bartlett hotel down the street, the Connor hotel also suffered at the hands of the flames in the great fires and burned down in 1898. Because there was so little land that could be built upon and all the buildings downtown were built do close together once a fire started it spread very quickly and there was no stopping it. But unlike many other shop owners, Connor had purchased insurance and was able to start construction on his new hotel very quickly. He made some lavish improvements on the previous hotel, and was up and running right away. The Connor Hotel was one of the first hotels in Jerome to have electricity and telephone lines. What was their telephone numbers you ask? Well just dial "8". There were only a few places with telephone so each one had a single digital number. 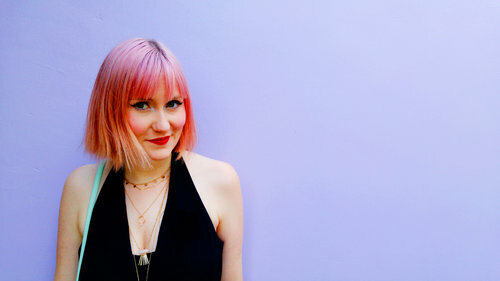 Everything inside the Connor Hotel felt luxurious. It was the top of the line for hotels in the West, know all over Arizona. But as the mines began to run dry and the travelling miners started back home, the hotel started to run out of money and by 1931 the hotel had to close its doors, for what they thought would be the last time. It still tried to rent out its first floor to different shops to make some money but the second floor remained dormant until the late 60s when the tourist boom awakened the city once more. After a huge renovation to update the hotel to modern safety codes and health standards, the hotel is inviting travellers back through its doors to experience a piece of history. But for day trippers that just want to see a piece of this treasure, go inside the Spirit Room to grab a drink inside the bar. It's full of little treasures from the original hotel and had so much character to it. It feels like a saloon from an old Western movie and you just expect a cowboy to walk through the door at any minute. By now you're probably pretty hungry and I've got the perfect lunch spot picked out for you! There's a lot of pretty cheesy restaurants when it comes to ghost towns. A lot of them themed on "ghostly" menu items featuring plenty of random western decor all over the walls. But Bobby D's BBQ Pit is just plain good food at great prices. In tourist towns, sometimes you just stuck with terrible food at high prices but this little gem is neither. It's just around the corner from both the Connor hotel and the Historical Society so it's the perfect place to grab something to eat before heading up the hill for the rest of our tour. Their drinks are all served in wonderfully western mason jar glasses which just adds to the down-home atmosphere to the place. Try any of their local craft beers or iced teas. Some of their most popular menu items are the brisket and ribs tips, Mac 'n Cheese, Jalapeño Cheddar Cornbread and Pulled Pork! Everything is smoked in house and you can smell the BBQ all over town - it is pretty hard to resist. Everything is absolutely delicious and the best picks for a great western luncheon. Once you're all full up on BBQ, it's time to relax and sample some of Verde Valley's best vino. Right across the street from Bobby's BBQ is the Bitter Creek Winery. There are a lot of wineries in Jerome. This isn't surprising as it's a pretty big tourist activity and some of these are pretty unremarkable. But Bitter Creek is one of those special places. It doesn't jump out at you but once you walk in the doors, you're hit by the stunning views of the Verde Valley. You can sit and relax in front of the windows with this incredible view while you sip on your wine selection provided to you by a wonderfully kind and knowledgeable group of staff. Bitter Creeks Wines have fantastically unique labels and no matter your tastes, you'll find something to bring back for yourself or as gift for friends or family. As you finish your last sample of wine, take one last look at the view and head out the door. We're going to head back along the historic Main Street where local artisans and souvenir shop owners have begun to pop up over the years. It's here you can find the most unique and interesting delights from chocolate fudge to vintage dresses to kaleidoscopes and hand painted art. There is something for everyone along this strip. Among the different shops you'll also pass by old run down houses, abandoned for years and years. It's interesting to see the marriage of old and new. But despite new tenants moving into these buildings, the facades and the structures haven't changed much, or at all, over the years. One of my favourite shops is OJ's Copper Country Fudge. It sells different sweets treats made using the same recipe they've used sine the 1930's. This feels like the kinda of place a miner might have taken his family to relax after a long week in the mines. Walk along Clark street toward the fork in the road where Clark meet Hill Street. This is where you'll veer off the path and start walking up Hill street. Before you start up Hill street, you'll pass by the scenic Surgeons house which was built in 1916 for Jerome's Chief Surgeon and used all throughout the heyday of Jerome mining boom for the nurse's residence. Many people were treated by the doctors here as mining was one of the more dangerous professions and it is widely rumoured that the ghosts still haunt the house today. The Award Winning Asylum Restaurant located at the Jerome Grand Hotel offers lunch and dinner services every day. 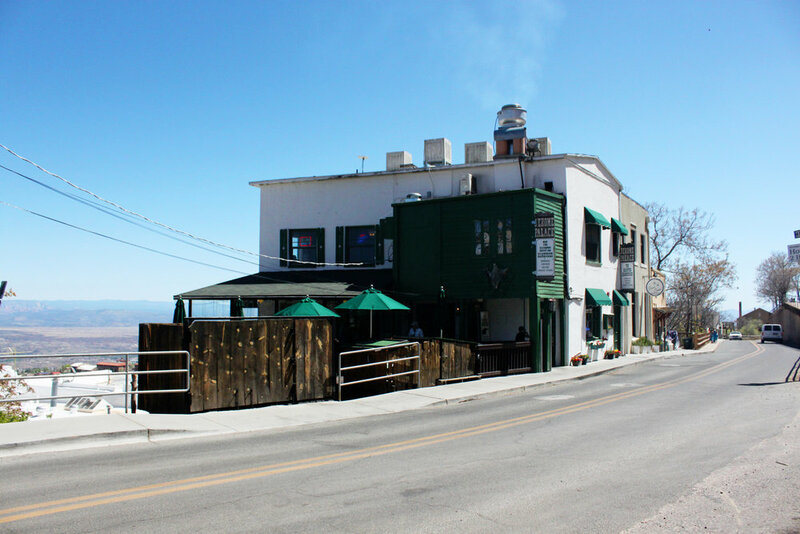 The restaurant overlooks the entire Verde Valley and provides the diners one of the most amazing views. Although the name seems a bit cheesy, the decor inside is beautiful art deco from the period the building was constructed. The food is all classic dishes and are wonderfully prepared by some of the best chefs in the Valley. Their best menu meals choices include Julienne Pastrami Salad, Char-Broiled Chilean Grilled Salmon and Mesquite Bacon Wrapped Filet Mignon. If you decide to stay the night, or even if this is just the last stop on your tour, ending the day at the Grand Hotel gives you a breathtaking view of the city and puts a historical button on the day. The Grand Hotel, as it stands today is fairly different in appearance from its original. 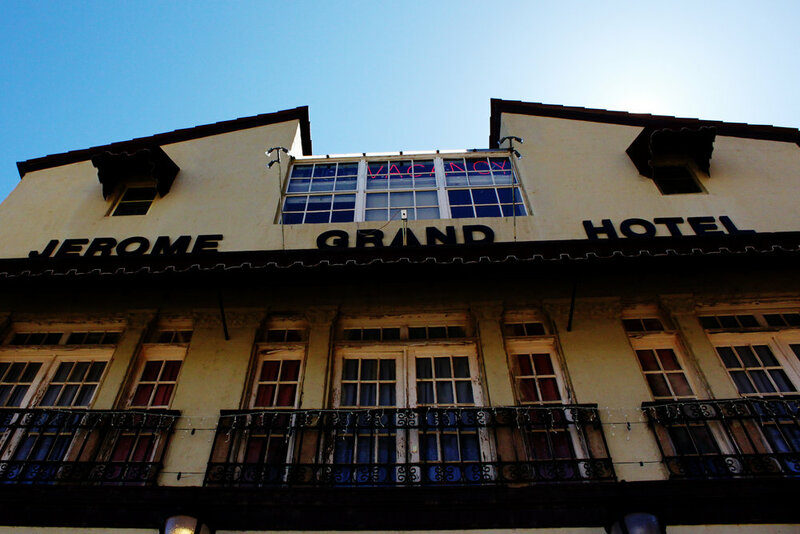 The Jerome Grand Hotel was constructed in 1926 as the Verde County Hospital. In 1920 it became one of the most modern and well-equipped hospitals in Arizona as the mining finances paid for the best services money could afford. But by the 50's, when the mining dried up, the hospital closed down. The building stood unused for 44 years until it was renovated by the Altherr family in 1994 and turned into a hotel for tourists. They made sure to try and make as little changes to the building to keep it as historical memory of this town as well as a functional attraction. The old hospital was built in the original mission revival style of architecture and was one of the last major buildings to be constructed in Jerome. Since it was so far away from the city centre it avoided a lot of the fires that broke out downtown and therefore remained more intact architecturally. Also, because it was a hospital and contained so many expensive machines, it was made to be fireproof and withstand dynamite blasts of up to 260,000 pounds. If you're brave enough to stay the night, you're up for a few chilling surprises. There have been several hauntings known to appear throughout the halls of the hospital. People report hearing smells coming from unoccupied rooms such as cigar smoke and whiskey. Others report televisions sets turning themselves on and off without explanation. There have also been two apparitions known to be seen on occasions. One in a white hospital gown and the other in a nurses outfit. Are you brave enough to survive a night in this ghost town? I hope you enjoyed this walking tour. 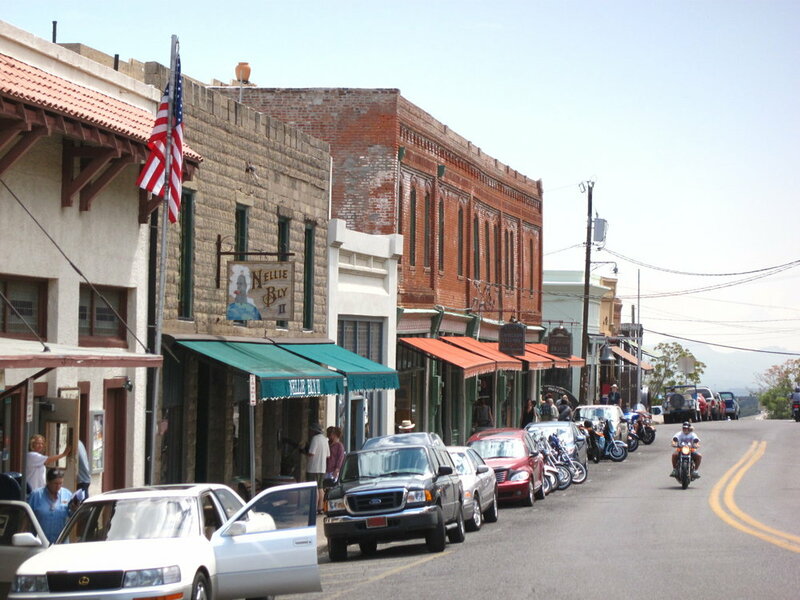 Jerome is a great place for a day out and will give you a taste of what a historic mining town was like back when it was the "Wildest Town in the West!"